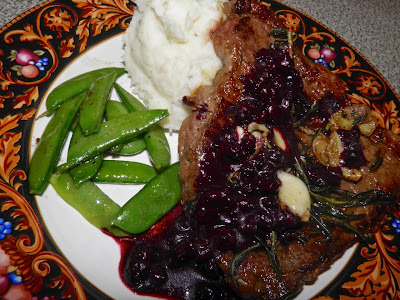 Steak with blueberry sauce, sautéed sugar snaps and fluffy mashed potatoes. Watching nature as it goes through its yearly cycles has an educational as well as soothing effect on me. It’s something that was missing from city life – something fundamental. You never know what next useful plant or flower you will find when you actually see as opposed to "look." I guess that’s why we say “the bounty of nature.” All we have to do is reach out to it. Recently I found something that nature supplied a little bit earlier this year than usual. Wild blueberries are just starting to ripen in Nova Scotia. We have a full week of hotter than normal temperatures and sun coming, so I imagine there will be some “good pickin’” by Monday or Tuesday. I picked three cups last Tuesday. Believe me when I say it was a labour of love. Since they’re wild, they’re only about 1/3 the size of the high bush berries most common at the store. So it takes some time, but the taste is dramatically better. But it was well worth the effort. Mind you, this recipe only takes a cup, and if you find a good spot you can probably accomplish the deed in about 10 minutes. For those of you who aren’t familiar, wild blueberries are Vaccinium angustifolium (lowbush blueberry). Cranberries are in the same Vaccinium family. They are native to eastern and central Canada and the northeastern United States. Their range includes as far south as West Virginia and west to the Great Lakes, Minnesota and Manitoba. Nova Scotia has a thriving commercial wild blueberry industry. Wild blueberries usually come onto the market in August. I’m not sure why they’re ripening now. It could be due to the good Spring we had or the abundant warm rain over the last while. For whatever reason, they’re starting now. I suspect that berries in the stores won’t be far behind. Blueberries are very good for you. They have the highest antioxidant content of any fruit. (Hascap may be a close second.) Antioxidants fight free radicals in the body. Blueberries also affect the body’s capacity for storing and burning fat, in good ways. The blue/red colour pigment is caused by anthocyanins that help fight hypertension. Those same chemicals help improve brain function. Pterostilbene, a compound found in blueberries, has been shown to fight colon cancer. Colon cancer is the second highest cancer killer among Canadians. Lung cancer is first. Steak pan fried in garlic/rosemary infused oil. Blueberries have an edible lookalike that matures later in the season, too. Gaylussacia reinosa (Huckleberry) is a native of Nova Scotia as well. They grow mainly on barrens and partly wooded land alongside the blueberry, but is capable of growing in shadier areas than their cousin. Many people don't know that they're not blueberries. The distinguishing feature is that they don’t have the matte blue colour, and the bushes are usually at least a foot high. They also ripen about a month later. 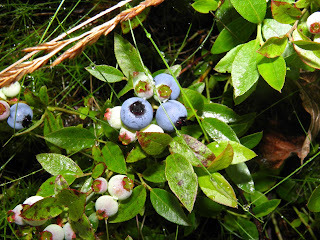 So if you miss picking wild blueberries you may want to look for huckleberries. 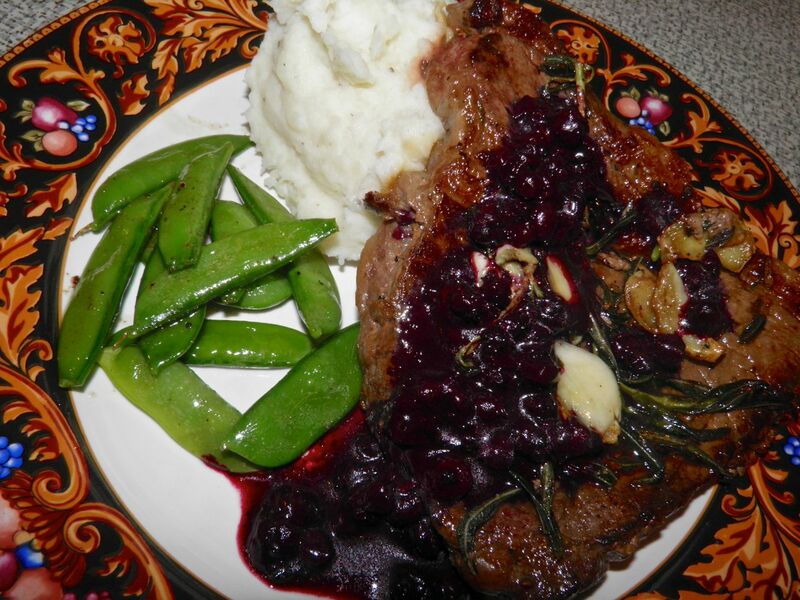 Desserts usually spring to mind when one thinks of blueberries, but they can be used as a savoury as well, like in this simple steak sauce. Red wine and rosemary infused, it literally takes less than 15 minutes to make. 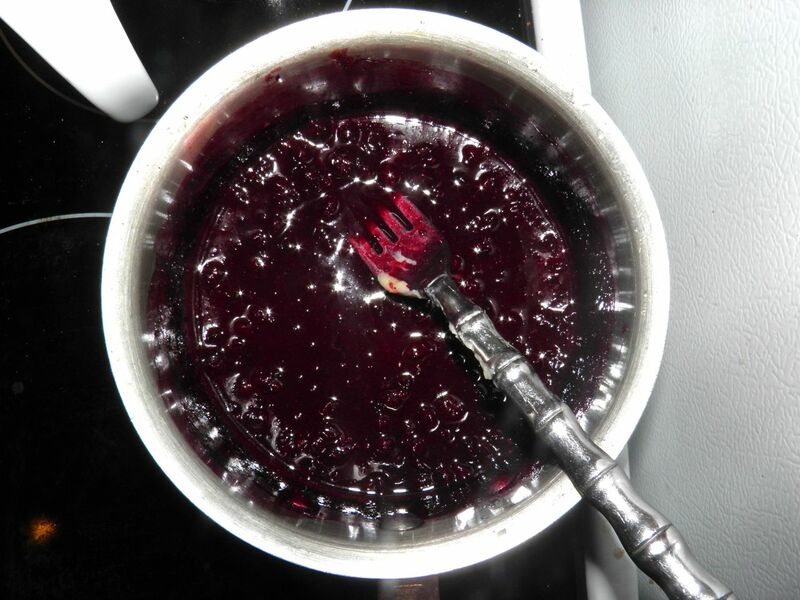 The result is a slightly fruity, herbal, rich sauce that pairs beautifully with beef. We still don’t have a barbecue, so I had to opt for pan frying our steak. That wasn’t a bad thing. I infused some oil with rosemary sprigs and garlic and then served that on top for a massive flavour boost. Once again, the herb garden to the rescue. 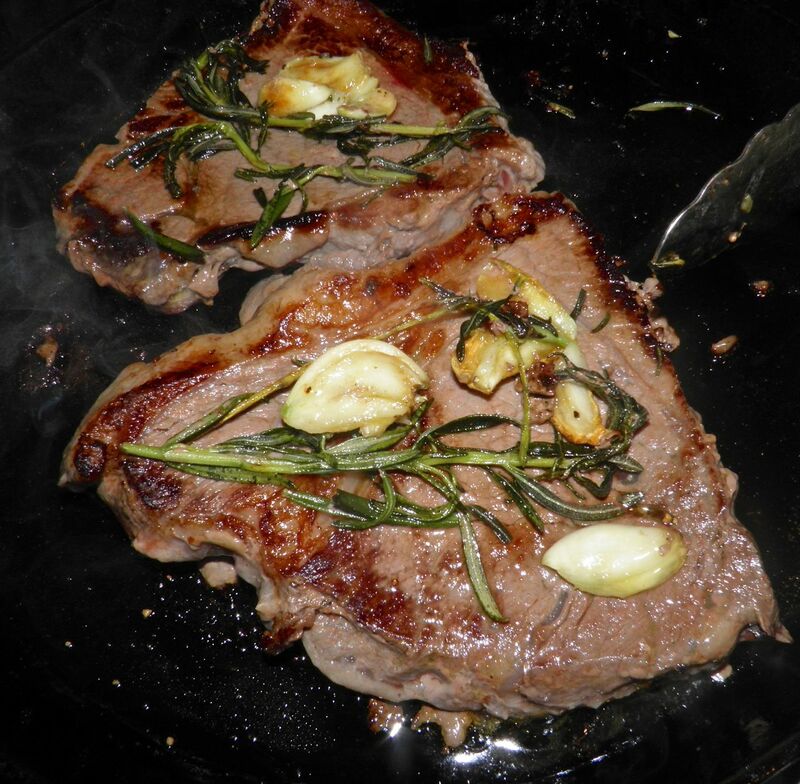 You can also just infuse oil and then brush the steaks with it as they cook on the barbecue. If you happen to have a spare cup of berries, and can steal 1/2 cup of wine from your glass, you should give this sauce a try. Since it’s going to be a scorcher all weekend, and neither recipe heats up the kitchen very much, these two quick recipes might be very well timed! You really can't get an easier sauce to make. Place the blueberries, wine, sugar, rosemary, pepper and cinnamon in a small saucepan. 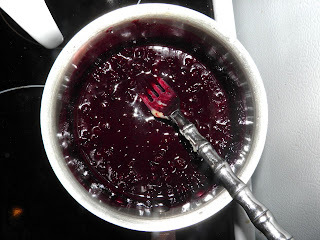 Bring to a boil, reduce the heat to medium and let simmer for about 10 minutes until the sauce starts to thicken. Remove from the heat, let cool for 5 minutes and then whisk in the butter to thicken. 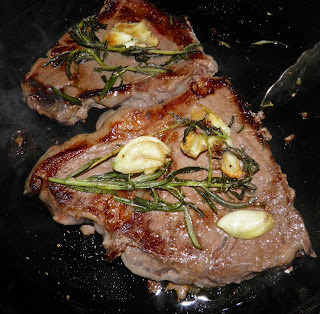 To make the rosemary garlic steak oil, place 3 sprigs of rosemary with the garlic and oil in a cold pan. Slowly heat the oil, taking care not to burn the garlic or rosemary. Pan fry the steaks in the oil on medium heat until done, or pour off the oil and use it to brush steaks on the barbecue.